Action from the 0-0 draw between Deeping Rangers (claret) and Yaxley. Photo: David Lowndes. Chris Rawlinson’s first game as Spalding United manager ended in defeat in the battle of the top two in Division One South of the Evo Stik Northern League today (February 18). Rawlinson replaced Dave Frecklington (who left for higher level Gainsborough Trinity) this week, but couldn’t stop the Tulips slipping to a 3-1 defeat at hot title favourites Shaw Lane Aquaforce from Barnsley. It was a disappointing 0-0 draw between Deeping (claret) and Yaxley in the United Counties Premier Division today. Photo: David Lowndes. Spalding trailed at the break before skipper Nathan Stainfield drew them level 10 minutes into the second-half, but the home side scored twice late on to extend their lead to six points (and they have five games in hand on Spalding). Spalding remain second, but they are unlikely to stay there for much longer as three clubs, Witton Albion, Newcastle Town and AFC Rushden & Diamonds are all closing the gap and have games in hand. Spalding are at Rushden on Tuesday (February 21). Stamford’s miserable campaign continued as they went down 2-0 at home to fellow strugglers Market Drayton Town at the Zeeco Stadium. The Daniels, who have dropped to 17th, dominated the first half, but were eventually given a lesson in finishing by their visitors who scored twice in the final 20 minutes. It was a stalemate between Deeping and Yaxley at the Haydon Whitham Stadium. Photo: David Lowndes. 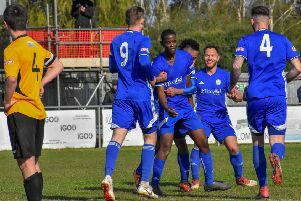 The big local game in the United Countes League between second-placed Deeping Rangers and fifth-placed Yaxley at the Haydon Whitham Stadium proved to be a damp squib as both sides drew a blank. “If I’d have paid to get in, I’d have asked for my money back,” Yaxley manager Brett Whaley said. Deeping, who had slightly the better of the game, stay second and were boosted by a shock home defeat for third-placed Eynesbury which also made it a great day for leaders Peterborough Sports. The city side are now nine points clear at the top after cruising to a 4-1 win at rock bottom Huntingdon. Avelino Vieira scored twice with Ollie Medwynter and Mapeo Mendes, a recent signing from Rothwell who was bagging his first goal for the club, also netting. Kieron Blanchard (white) in action for Peterborough Northern Star at Sileby. Photo: Tim Gates. Lee Barsby fired Peterborough Northern Star in front at Sileby, but the home side hit back to win 2-1 thanks to a last-minute winner. Holbeach led at struggling Kirby Muxloe, but went down 3-1, while Wisbech trailed at Rothwell Corinthians, but recovered to win 3-1. Billy Smith. Alex Beck and Liam Adams scored for the Fenmen who have moved above Holbeach into seventh place. Blackstones were beaten 3-0 at home by Potton in Division One. Dan Wilson (white) in action for Peterborough Northern Star in their 2-1 defeat at Sileby. Photo: Tim Gates. March Town lost 1-0 to Whitton United in Division One of the Thurlow Nunn Eastern Counties League. That’s four defeats in a row without scoring a goal for the Hares. Stamford 0, Market Drayton Town 2. Deeping Rangers 0, Yaxley 0. Rothwell Corinthians 1, Wisbech Town 3 (Smith, Beck, Adams). Blackstones 0, Potton United 3.